A Launchpad bug report is not the place for a debate about the design. Kindly post your suggestions on the wiki page. Your feedback is valuable. 1. Back, forward, up, stop, reload, home, zoom, a location bar -- these are the same controls available in my web browser that I know and love. Why do they look so different here? They take up so much more space, and they occupy two toolbars where my web browser needs only one. 2. What does the Stop button do? 3. Why do back, forward, up, stop, etc. have text labels? They don't have text labels in Firefox. The icons are good -- I recognize the symbols and understand what the buttons do. 4. Why do I have "Home" and "Computer" buttons when the same functionality is available and made much more useful in the side pane? That seems redundant. These questions prompted a very simple rearrangement of the default controls (see attachment simpler_nautilus.png). 1. It should be at least as simple to browse your local documents as it is to browse the Internet. I've combined the Navigation and Location toolbars into one. 3. I removed labels. The icons are salient and tooltips are available. 4. I left the home and computer buttons untouched, but removed them in another mockup (simpler_nautilus.png). What do you think? Can we simplify Nautilus, even if not this drastically? 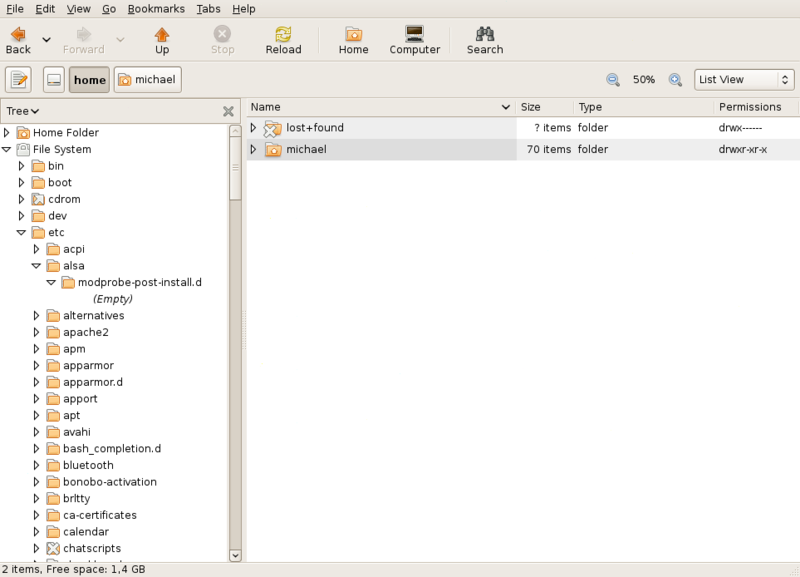 Mockup of a simplified Nautilus file browser. 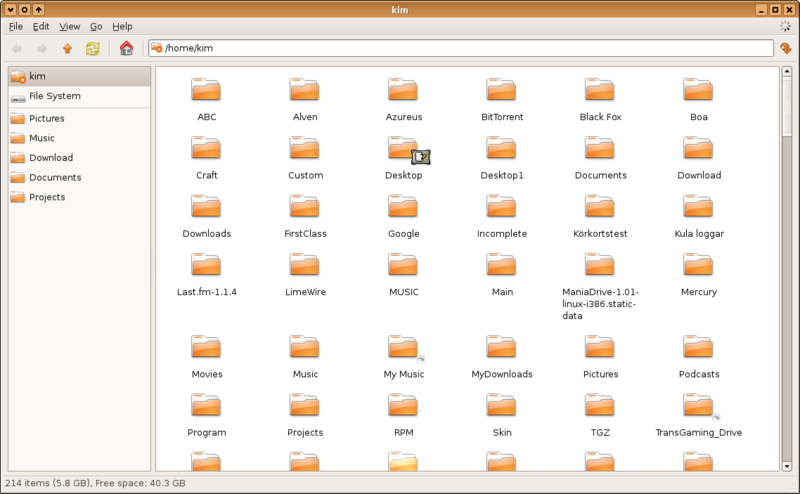 Mockup of an even simpler Nautilus file browser. This removes the view changer and zoom icons (they are available in the View menu) to give more room for the location breadcrumb. labels in for a reason. is good just the way it is, simply because that's how it's configured in GNOME. configuration, and more like the inclusion of everything and the kitchen sink. > labels in for a reason. big icons + text and instead uses small icon, no text. + space, and they occupy two toolbars where my web browser needs only one. Nothing personal, just my comments on the proposed design. removed some elements, and moved others around. >> labels in for a reason. > big icons + text and instead uses small icon, no text. > Nothing personal, just my comments on the proposed design. > users and a proper usability study should be conducted beforehand. Indeed, my oversight. Most of the point still stands though. David, I like your suggestion of simplifying the default configuration. 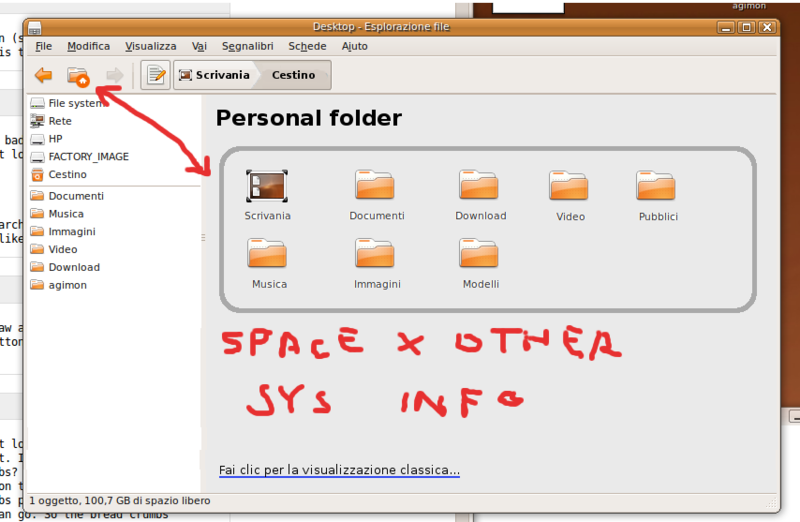 I think we have to be extremely careful of what we actually change, as it can have a tremendous impact on file browser's usability (and, as a result, on how Ubuntu is perceived). My call would be to run a series of user tests with various configurations and see which areas could be problematic. I strongly agree though that nautilus needs to be simpler and deal with screen space better. This is a high priority papercut, as it affects major area of the UI and impacts most user groups. In my opinion ignoring the gnome setting whether or not to show text labels in toolbars should not be ignored in nautilus. if users don't want text labels, they can set it accordingly system wide. Personally, I use all of the UI elements in Nautilus regularly. 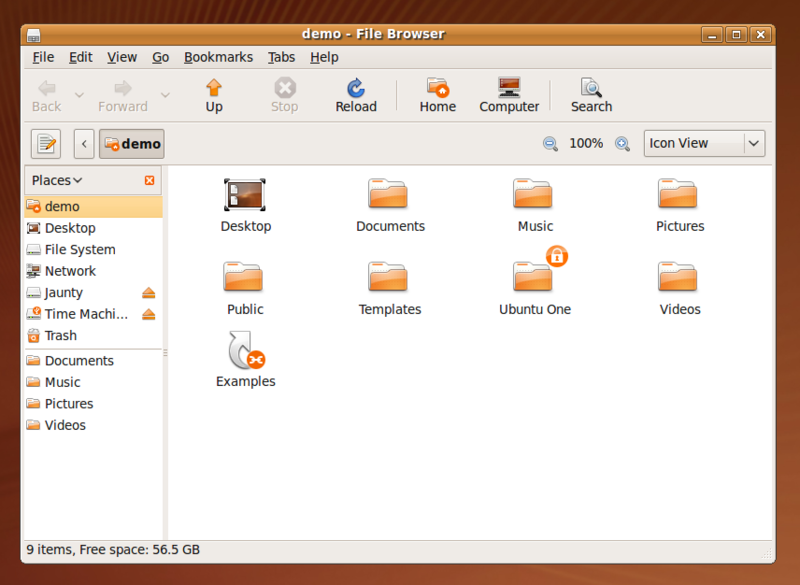 Including the side pane, including the zooming icons. And I value the location bar very much, that's one of the best features of nautilus. Please don't start overactively simplifying stuff without consensus and it being well thought through. Thanks! > want text labels, they can set it accordingly system wide. option to change it by adding or modifying features. > Personally, I use all of the UI elements in Nautilus regularly. > location bar very much, that's one of the best features of nautilus. > it being well thought through. Thanks! opinions and suggestions are most welcome. > Why do back, forward, up, stop, etc. have text labels? They don't have text labels in Firefox. I like the mockups. To simplify things further, why not leave out the back and forward button as well? The up button, the directories shown in the browser and the bread-crumb location bar make these a bit superfluous. The right way (IMHO) is reduce from 2 toolbars to 1. About removing strings, just change the priority for Previus and Next items. > 2. What does the Stop button do? The stop button makes it possible to stop loading network/remote folders and folders with a lot of items: quite handy when you have to browse a lot on the local network. > I like the mockups. To simplify things further, why not leave out the back and forward button as well? The back button is pretty handy if you go from a random folder to one in your bookmarks and then want to move back again to that last folder. 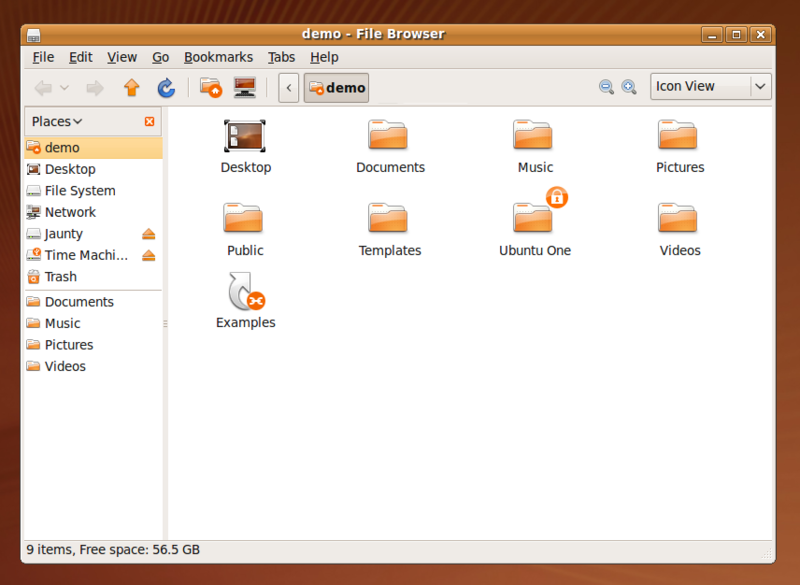 I don't use the zoom icons actually, so I can't say anything about that, but the change view option right next to it is a really nice thing (a lot of people nót used to ubuntu liked it when they had to work on our kitchen pc). What can be improved though is the breadcrumb itself: when directory names are long every breadcrumb disappears but the current directory and the arrows. If there could be a cutoff / max lenght of the shown name, that would prevent 'loosing' all the breadcrumbs. About the text underneath the icons: I always disable it, but at my parents pc I did not disable it because they need some more feedback. I can understand that in a (file) browser you don't want it, as well as in a music player (Rhythmbox). 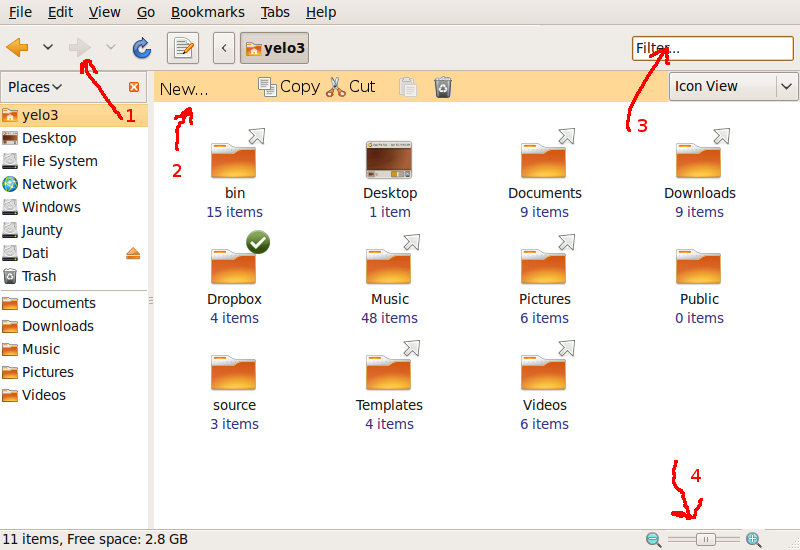 In Rhythmbox is an option (Toolbar Button Labels) to follow the Gnome style, or to manually set it. This would be nice to have in Nautilus. Default can than be off, while preserving the overall style of showing text below icons. 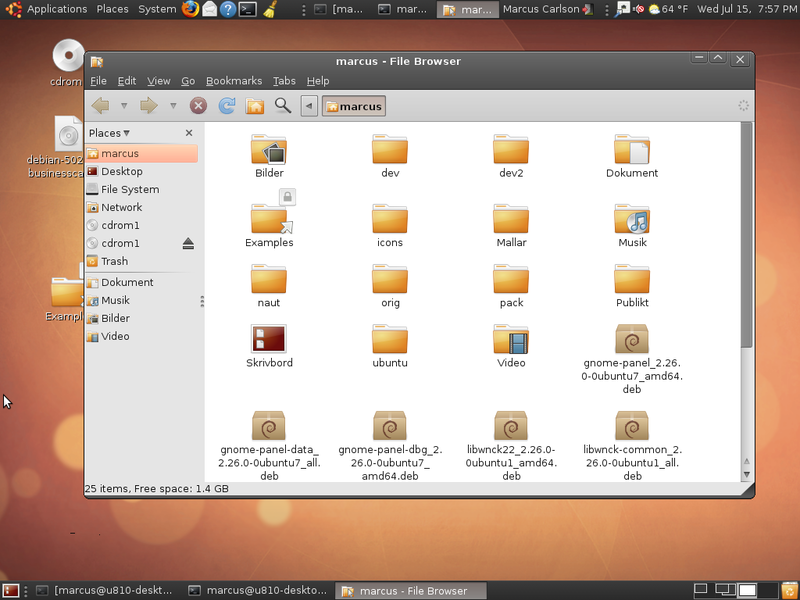 I like and use everything in the current nautilus tool bar, zoom, location bar, and like the large icons. The options are there if anyone wants to disable items, rather then change it (which I don't think is necessary) we should just make it so it can be edited with ease (like in epiphany). Having large buttons are surprisingly good if you use them alot, especially on small screens, you would expect smaller buttons to be better since they give more screen space for the icons, but it makes navigating and clicking on them harder. On an netbook the larger buttons work like a charm. to the Nautilus toolbar which would open a new tabbed Nautilus window? I remember seeing a mockup of Nautilus once (on planet.gnome.org) where the zoom and view controls where moved to the status bar. In place of these controls was a search field. It's a pretty good idea because it makes use of a mostly unused space to keep functionalities. 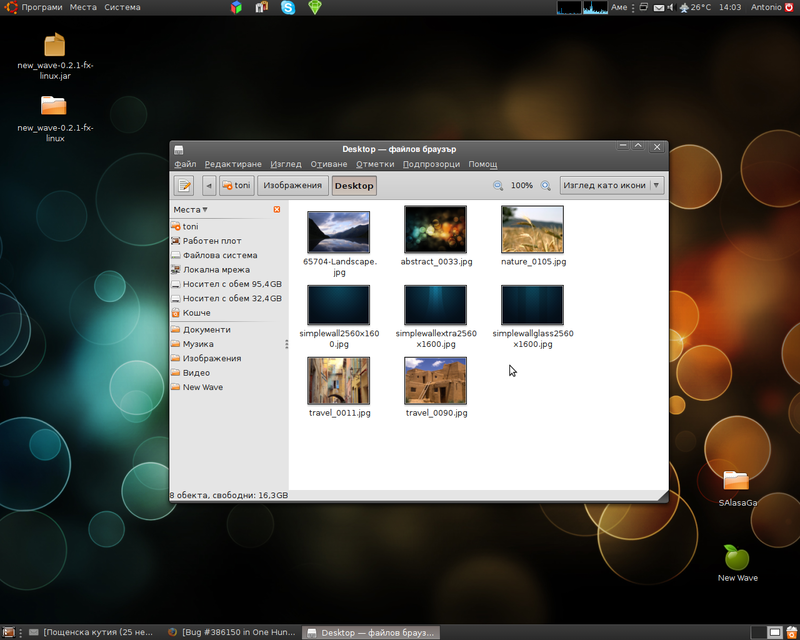 David's second mockup (http://launchpadlibrarian.net/27798051/simple_nautilus_2.png) looks very similar to Thunar interface to me (the file manager of Xfce). Everyone liking the mockup may want to take a look at the cap attached. i agress that something needs to be done with the default view of nautilus. on a 1280x800 laptop screen, the toolbars are taking up a lot of screen real estate. one other thing that i've noticed thunar has that nautilus doesn't is the "used space" of the viewed folder in the status bar. I was going to log this as a seperate request, but think it will be worth bundling this with the overall look of nautilus. That might sound stupid, but I kind of miss the tree view style to navigate into sub-folders, etc, without actually opening the folder itself. This is specially annoying if you have too many files in one single folder (such as logs, etc), which consumes machine resources even though you are willing to go to another place... If you use the address bar, then it is just the same of using the terminal (that's what I'm doing, besides when I want to open images and movies). Does this sound too much of windows poisoning? I would like to see tree view, too. It's faster and would, in a way, replace the location-bar-thingy, which imo is a bad compromise. @bruno.barga and Jänz: To me it sounds like the feature you are asking for is already implemented in Nautilus (see screenshot). Buttons are too bulky for the breadcrumb. I'd prefer a different widget; something that made them all look like part something, but independent within. If anyone else shares the sentiment, I can make a mockup. The zoom buttons in the statusbar is a good choice, as is the right-aligned search textarea. I think that there should be option to create your own toolbar in Nautilus. Whatever we will put together will never 100% satisfy all users (especially power users) and at the end linux is also about choice. Evince and Eye of Gnome have this option (if you go to Edit -> Toolbar) and I love it, you can add and remove icons as you prefer. 1. In my mockup, I have removed dropdown menu arrow from Back icon and left only one next to Forward (there is no need to have two). 2. I have removed Up, Stop and Reload buttons, which are not so much used. You can substitute Up with Back and Forward and also you have bellow it breadcrumbs which allow you using one click to get up. 3. I have also removed Home icon which user has in sidebar (together with other places) and I have moved Computer icon into sidebar. In my mockup I have replaced File system entry with Computer, because I do not believe that it makes sense to have both of them next to each other. 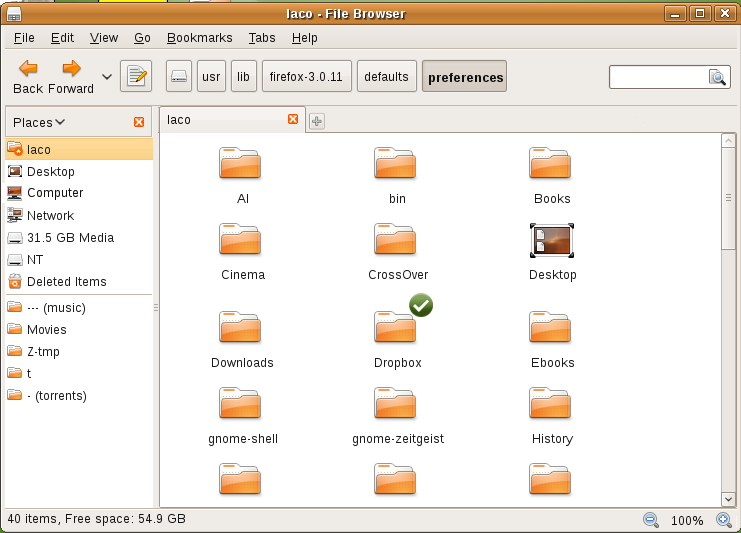 Plus File system is available from within Computer. 4. I have removed search icon but added search box which will make search more usable and it is well known from web and browsers. Nautilus search is very good so I think we should make it easier to use (especially for search-dominant users). 5. I think that by default nautilus should always show at least one tab. Right now lot of users might not realise that tabs in nautilus exist and that they can use them. I have also added little button next to last tab which will allow user to add new tab. 6. I'm not so sure where to put zoom icons, but I think this is good feature and it adds to usability and accessibility, so it should be visible. In mockup 1 I have added them into tab toolbar and in mockup 2 I have moved them down to status bar. Alternative would be to have one more thiner toolbar under main toolbar with zoom icons and I would also add there three icons to change view mode (icons, list, compact) because there is no point in having toolbar with two icons. Please feel free to comment on mockups. Here is second mockup with zoom icons moved into statusbar. I wish I could right-click the toolbar and select "customize" as you can in Firefox. I hate having to use the menus, or learn keyboard shortcuts, for functions I use frequently (show hidden files and show/hide side pane for example). I also like to switch between icon and list view (and preview, when the file manager has that option) so for me it would much more convenient to have clickable icons instead being forced to use the combobox. I think it's a great idea to have the file browser look like and work just like the standard internet browser. Simplifying and cleaning up the interface is a great idea. But, I do think you can make exceptions. The wording below the icons doesn't distract much and helps the absolute novice. You could include the option to make the words disappear for more experienced users. 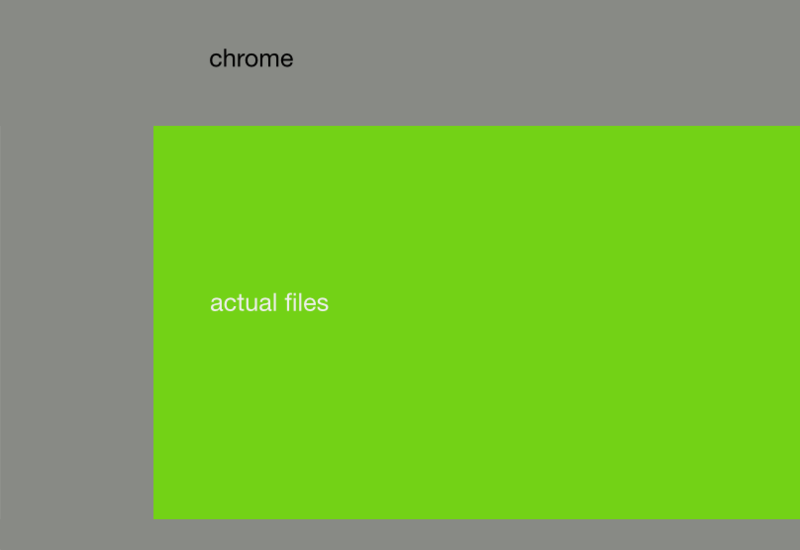 But, there is one aspect of the file-browser that differs from the internet-browser, which I find quite disturbing. The search field is not positioned next to the location field and it doesn't have it's own dedicated search-area. Instead, the search field replaces the location area or uses the location area as it's search area, when you press it. I find that quite confusing. I would suggest implementing the search field just like in the firefox browser and deleting the "icon view" tab from the ui, since this is something you don't really change that often, at least I don't. The icon view could simply be another point in the folder "view". Thanks for your great work and I hope you achieve your goal in beating OS-X in terms of usability;-) You can make it! 1. Place all shorcuts in sidebar (i.e. Computer) - no shorcuts in toolbar. Maybe a permanent Search Field could replace Home, Computer and Search buttons ? Maybe it's more than a papercut ? I've now completed the combined stop/refresh button and new packages  should be available soon. 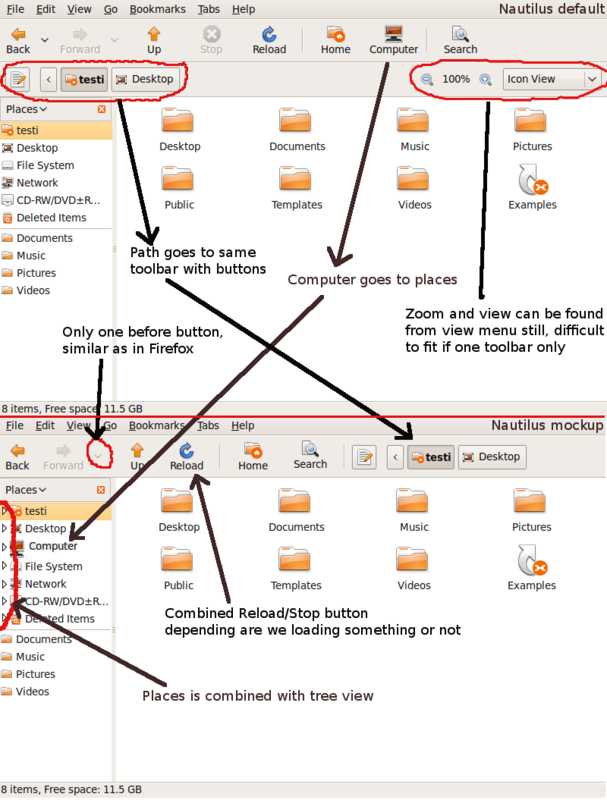 Attached is screenshots of the different toolbar states. 2°) When i said "please send another mockup with text under icons to see how your idea behave in all configurations. Is the location bar still visible ?" i wanted to say : "to see if there is enough space on the only toolbar to display both big buttons with text under (=default setting in GNOME & Ubuntu) and "Location Bar" on the same row"
David, whats your comment on the mouse wheel zooming comment by antistress? antistress, sorry, I forgot that screenshot. Attached now. For the zoom option, it's possible to have an control like openoffice in the status bar? Could we *exclude the drop down arrows when inactive* ? ie. the drop down arrow is shown *only* for any location history having more than 2 items. the back button is oddly smaller than the rest of the buttons. mac_v, I've begin talking to upstream too see what they think about these changes before doing anything more. For the interested I've created jaunty packages  to play with. 1: I Find the lack of the "Up" Button crippling. I would even suggest replacing the "Home" button with the "Up" button. But I have realized there is more space wasted due to the 2 drop down buttons. We could remove one drop down button and reduce its size , This is allows us to Add the "Up" button without compromising the space. The single button can function like firefox's drop down menu. 2: You might already be aware of this, but just to bring to your attention. The Appearance Preferences > Interface > Toolbar Button labels option has no effect. Oh... and before people jump on the "Up" not needed because of breadcrumbs. While using "Up" you can go to any parent folder. Without moving the mouse , by just repetitive clicking in one location, which is easier than using Bread crumbs. 1. we could move Home and Search icons to "places" area, we need to free space on main toolbar. I didn't like the double url-bar and search-bar. 2. for location I made a mockup but I not so sure that could be usefull. 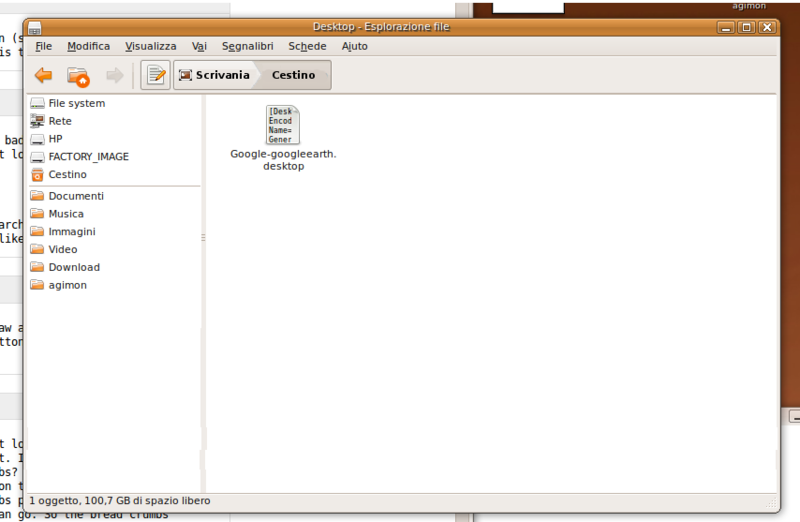 We have already Go menu in toolbar and "less-is-more". mac_v 1) About the drop down buttons I agree they take up a lot of space and by using Firefox style you mean right clicking the button? mac_v 2) Yes I know, I've hardcoded it. Do we want to use the global setting for nautilus? Personally I've never liked it because the applications I used a lot I may just use the icons, but new applications or rarely used I might want to have the text as extra help - but that's off topic. Danielsan474 1) Can't it be psychological to have a Home icon to click if I get lost? Danielsan474 2) Input textfield in the menu?? 2. I like the two-status concept of Refresh-Stop and I place this icon-button between Backward and Forward icons. If I don't want go back or go forward, I could make just like "a little jump" (refresh) where I am now. The users-blog-experience gives some hints (think about the breadcrumb). Why don't assume the widget idea too for left-area? A widget for search, places, folders, ecc. Danielsan474 - ahh, I now see what you mean. marcus 1) Can't it be psychological to have a Home icon to click if I get lost? yes, it could be but Home is a place, not an action (go backward, make a jump-refresh, go forward). The same for Search. In fireforx we didn't have a left-area to put these items. 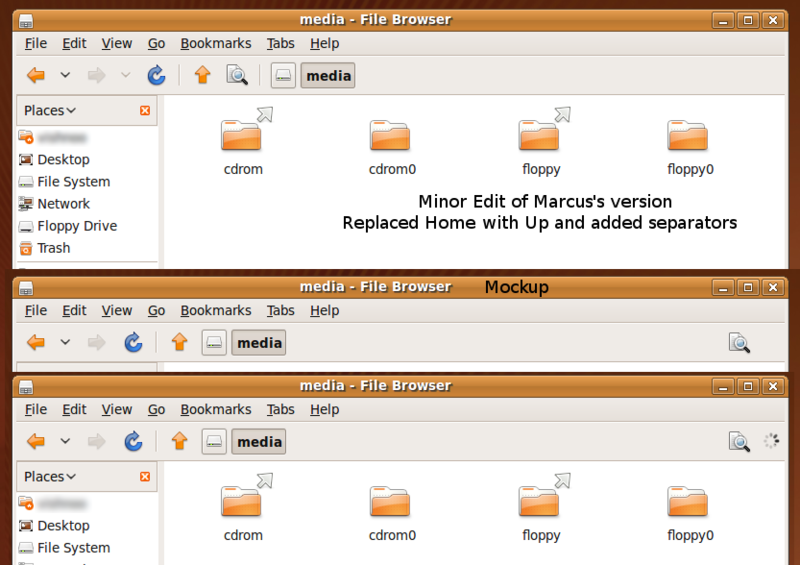 marcus 2) Input textfield in the menu?? 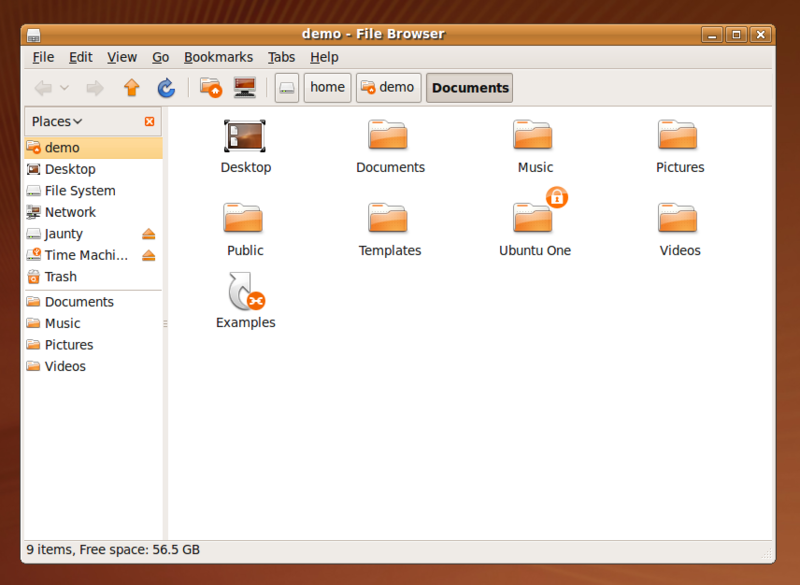 since my left-area concept share some ideas with gnome-shell project, this one should be an optional in long-run. 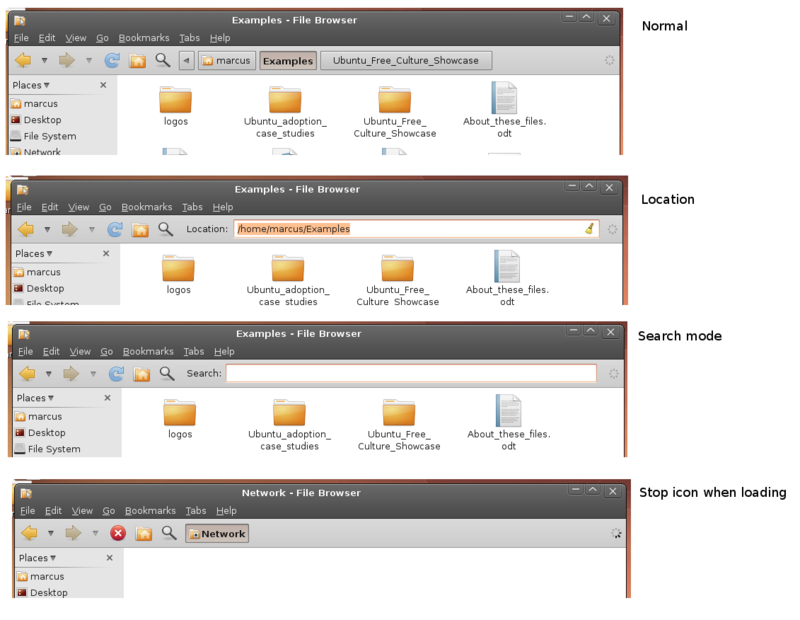 It depend on what a user want to do: click on Activities (gnome-shell) every time or use search-places-folders in nautilus window. 2: Right side is very empty. Its better to move it to the search to the right, just to the left of the spinner. This also partially negates the emptiness of the right side of the browser. "instead for Search (icon + "Search" label) we could have an input text field. We don't need to click on a search-icon, open a windows or whatever and digit some text; we could write directly on that field. If Joe wants more, could open an extended search window if needed..."
It would be a giood idea to save consistency through GNOME applications. GTKFileChooser already has a good UI for Search : an entry in the sidepane that replace the location field with a saerch field. We should do the same. antistress wrote: " Moving the the Search button away from the other doesn't seem a good idea to me in terms of usability"
If you use the ppa , you will realize that the browser on the right looks very empty. A good design should not cram everything on one side and leave the other side empty. there should be a balance. The previous search button was the right-most button,in Firefox too ,the search bar is on the right, so this doesnt break anything. I think the design team should take a look at the present version Marcus has done and make suggestions on the design aesthetics. the stop/reset amalgamation as those wouldn't really be fixed by an editor. @Marcus Carlson: So does that mean this bug can be closed? What about your ppa? would you stop working on it? mac_v, as far as I know Ubuntu doesn't want to have a lot of patches to drag along, so continue working on this is just a waste of time, correct David? But if Ubuntu would like to have patch for this I'd be willing to help. The upstream bug for a toolbar editor is at  and there is an old patch. My plan is to first bring this patch up to date and if I manage to get that far I'll see what I could do after that. 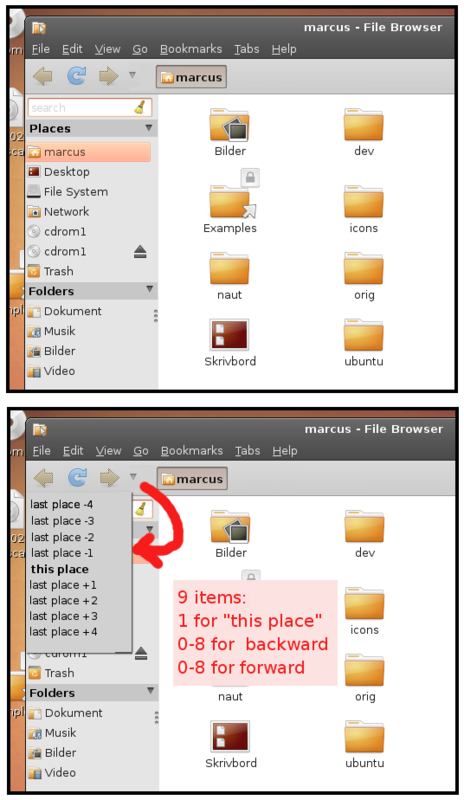 Besides i've never find the Nautilus Search UI to be intuitive. It's very hard to understand as far as i'm concerned. Maybe the only Search button/entry effect should be to launch a dedicated application (gnome-search-tool today (or a GUI for Beagle/Tracker), Zeitgeist tomorrow for instance) ? To those who advocate removing the 'up' button: I disagree. It was removed in Windows Vista, and someone had to make a shareware app to put it back in. There are those of us who think linearly, and who use the location bar by default. For us, it is a lot faster to use the up button than to use breadcrumbs (which does not fit with the way our minds work). Please include a preference option for it to be put back in. Even better, allow full customization of the toolbar like Firefox does. > Even better, allow full customization of the toolbar like Firefox does. Great work, everyone, but it is clear that this is not trivial to fix, and therefore is not a paper cut. 2. Let the Location bar distinct : it allows to display LARGE PATHS! I much prefer the having the button to switch between breadcrumbs and text url. We're talking about getting rid of redundancy, if we have both, it's just plain horrible. If you use the button that switches the breadcrumbs to the text, it stays that way when you open nautilus next time. Also, if the breadcrumb buttons are changed as discussed above, it will be able to display more path. I dislike the idea of a switching button, it seems indecisive. space eaten up needlessly otherwise. > will be able to display more path. I hope you guys are not serious about inflicting this on your users. If you want to simplify things, the gnome guys already did it for you years ago, with spatial nautilus (you know, the default nautilus mode that Ubuntu specifically patched out to not be the default? 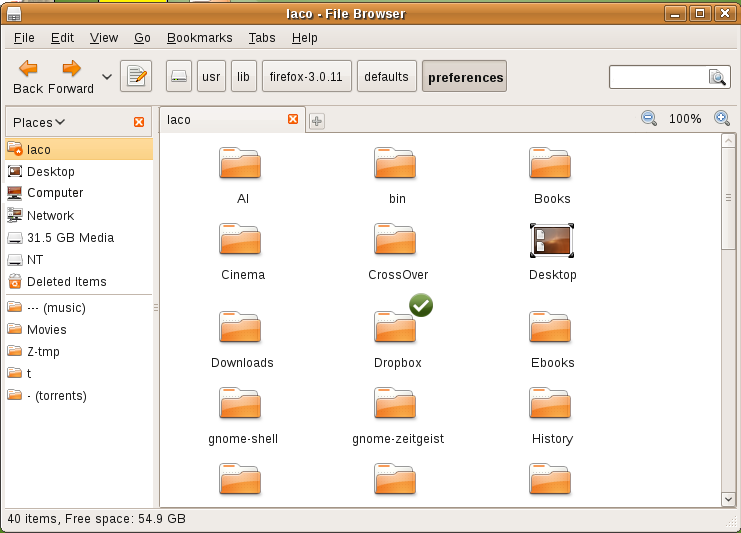 ), which was the hallmark of simplicity/minimalism/usability* (and is the default in Fedora, from what I've seen). Crippling the "browser mode" of nautilus (which is for users that can't stand spatial nautilus' minimalism) will pretty much result in angering those users, and usability-conscious people just recommending others to avoid ubuntu desktops because Canonical keeps doing parallel work and doing away with the principles set forth by gnome (ignoring the desktop's toolbar label settings? seriously?!). Unless gnome decides that this is the new canon that should be implemented on all apps, of course. Just my warning/2 cents. I don't really care that much on a personal level, in the grand scheme of things, the people will decide if this is a good or bad thing, and I can still use spatial nautilus. So waht about this? I really love the way nautilus was changed. Maybe for 10.10? Displaying first 40 and last 40 comments. View all 144 comments or add a comment.